Gulf views abound at Pacifico, an incredibly luxurious and serene condo unit that is the ideal tropical oasis in Gulf Shores. You and nine of your closest friends and family members can take advantage of all the Gulf has to offer when you stay in this incredible unit. Step into the tranquil interior of this property, awash in beachy blues and whites amidst sophisticated beach décor. A fully-equipped kitchen opens to the dining and living rooms within this spacious, airy floor plan. Meanwhile, the roomy guest room houses both loft and queen beds, and the immense master suite has a plush queen bed and a full private bath. Christy and Kevin are the proud owners of Pacifico, which is conveniently located near several other Harris Properties vacation rentals, including La Bendicion, Amanecer, Beach Dream, and Aqua Viva. 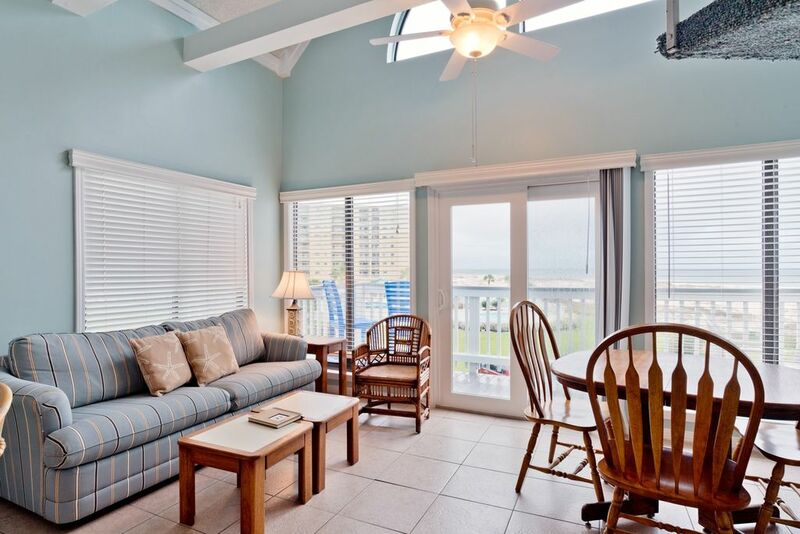 For larger parties of friends or family members interested in staying somewhere close to each other during their time in Gulf Shores, renting out any of these nearby properties is a wonderful choice for your trip accommodations. Pacifico enjoys a number of community amenities, including onsite boat trailer parking, tennis courts, a basketball court, a putting green, a fitness center, two outdoor pools, and rentals for jet skis, parasailing, and beach chairs. In the larger community of Fort Morgan, you and your guests will find numerous attractions and activities to check out. History buffs will love Fort Morgan Historic Site, where you can hike and explore both inside and outside of a fort that once played an important role in American history. Amateur (or professional) anglers should try fishing at the Fort Morgan Fishing Pier, or at Gulf Shores Marina, where there is also a bait shop. Or, if you feel like hitting the high seas, set a course to the Gulf's glittering waves from Gulf Shores Marina, which also offers boat and boat slip rentals, or from the Fort Morgan Public Boat Launch. For a meal between adventures, pair seafood with a view at Tacky Jack's, or head over to Sassy Bass Restaurant for excellent takeout pizza. Sassy Bass also has a handy general store and package store on-site for your convenience! Let the Gulf Shores Vacation Experts Help You Plan Your Best Trip Yet! Contact our team of reservation specialists to learn more about the sights to see and things to do in Gulf Shores when you reserve your trip accommodations in Pacifico or any of the other lovely vacation rentals available through Harris Properties today! Washer and Dryer located on the 1st & 3rd floor. The place itself was nice. The view was amazing, as was the beach. We had 4 adults and 6 kids ranging 15 to 7. It was tight for space when we were all in there. There could be more confortable sitting for that many people. The couch wasnt very big and the 2 kids that slept on said it was very uncomfortable. All the bedding wasnt very clean. There was a big yellow spot on one of the flat sheets. The ceiling fan didnt work. I had called the main number and they had someone come to take a look at it. He wasnt able to fix it, just fixed one of the lights on it. He said he was going to bring us 2 box fans and he never did. There wasnt a dustpan to pick up the dirt after sweeping. There was only one kitchen hand towel and no kitchen wash cloth. There wasn't even enough shower towels for all 10 of us staying in there. All in all it wasnt a bad place. The property is a great place to bring your family and friends for a fun getaway! I liked how the property was designed, with the upstairs being an extra bed and having plenty of floor space. The view was great and there were plenty of dishes and appliances/supplies to get through a week. Would definitely book again. Hi Douglas, thank you for the five star review! We are pleased you found Pacifico to be roomy and suitable for your family getaway! Thank you for letting Harris Properties help you find your spot in the sand! Pros: Right on the beach, multiple pools including an indoor pool, and tennis and basketball court. Family friendly facility. Check in is very easy. Cons: The unit itself needs some TLC. The lighting throughout the condo was very dim. The rooms only had bedside lamps, and the ceiling light in the living room and hallway didn’t work. The kitchen area is VERY SMALL. You can fit a maximum of 2 people in the area between the sink, refrigerator, and stove. The bathrooms need the most work, especially the master bath. There was rust in the tubs, as well as dirty/old curtains. There was also hardly any hot water. There isn’t a washer or dryer in the unit which is fine, but none of the washers or dryers in the laundry room locked, so you have to leave your clothes at your own risk. Hi Hope, thank you for the review as these help us take corrective actions towards our properties. We will make the owner aware of your suggestions. We have the washer and dryer listed as a communal under the general area of the property page. We apologize if there was any miscommunication. Thank you for letting Harris Properties host you. We hope that you will give us a chance to host you again with a 5 star stay. Everything was wonderful: location, condo, ease of travel, etc. Only problem were two of the beds, the one in the loft room and the double in the bunk bed room. Loft bed was very uncomfortable. You could feel the springs. Killed our back. The double was sunk in the middle. Like sleeping on a sway backed horse. If those are fixed, perfect! Hi Jarrett! Thank you for the review. We are happy to hear that your stay was wonderful. We appreciate your feedback concerning two of the beds. We plan to address the issue with the property owner. Thank you for again for allowing Harris Properties to find your perfect beach getaway. Complex was well maintained. Room was good needed couple new things. (Couch & mattress upstairs) Overall great stay. Hi Jamie, thank you for the review as these help us take corrective actions to our units. We have e-mailed the owner to make them aware of the couch and mattresses. We are glad that you were still able to enjoy your stay despite these inconveniences. Thank you for letting Harris Properties help you find your perfect spot in the sand, we hope to host you again with a 5 star stay next time! We had a great time and will come back again. Hi Richard, thank you for the review. We are so glad that you enjoyed your stay at Pacifico. We hope that you had a wonderful stay! Thank you for letting Harris Properties help you find your perfect spot in the sand. We hope to host you again soon!